I got 3rd place!! Whooooo hooo! 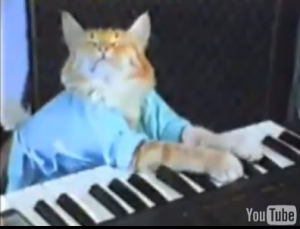 I can't believe it, I got 3rd place in the Great American Keyboard Cat Competition!!!! My puppet is now slightly famouser than he was last time I posted! I'm so flattered because there were apparently hundreds of entries. I believe I get some sort of autographed poster-type thing for my prize, but the being-on-tv part was better than anything they can send me. I am proofreading the pattern right now so you can all knit your own matching puppets very soon. 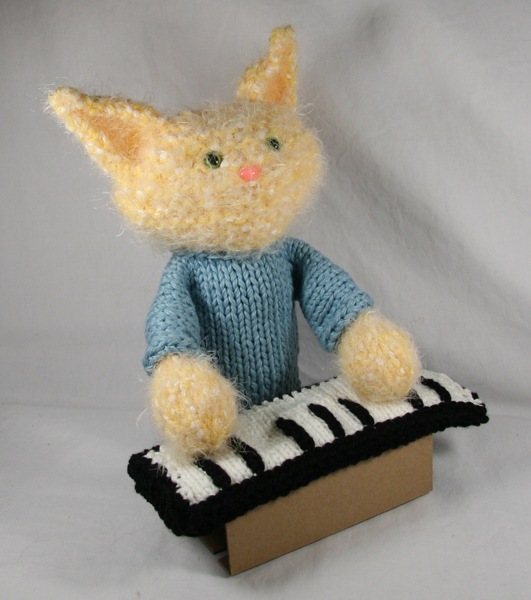 Knit him off, keyboard cat. I am currently knitting a keyboard cat hand puppet. My wrists are aching, but I have to hurry up and finish it in the next day or two so I can send it to Kevin Pereira for the Attack of the Show Keyboard Cat art contest on G4 (a nerdy video-game-centered cable channel). I don't particularly want to win any prizes, I'm mostly just hoping they'll show it on television. He's nothing but a headless blue shirt and a detached, eyeless, fuzzy head right now, but I'll post pictures before I send it. I jotted down the basic instructions too, so I might have a new pattern up on the site for the first time in years. I went all out and knitted him a little piano. Here's the best part: he has magnets in his paws so that he's drawn to the keys on the keyboard. I know a hand puppet is kind of stretching an "art contest" entry, but with any luck, they'll like it anyway. I've recently become obsessed with The Itty Bitty Kitty Committee. They're currently raising money to help homeless kitties at the Humane Society, so I thought I would pass the word along. 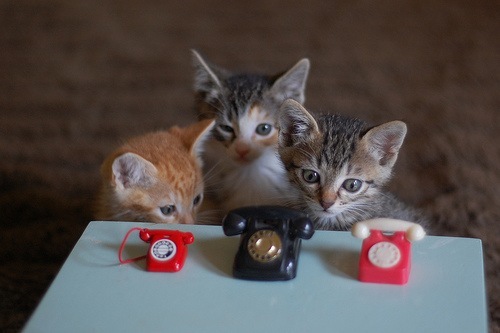 Adorable operators are standing by to take your call! ...But they're not very good at working the telephone, so perhaps you should go to their website and click on "donate" instead.